I couldn’t type the date for this week’s Week In Review without mentioning that it is my Grandmother’s Birthday. Living in what was her house, I think of her and my Grandpop all the time. But today…Happy Birthday, Gram! Week In Review is hostessed by the lovely, the energetic, the veggie obsessed Meghan from Clean Eats, Fast Feets. She is an amazing woman and a generally all around fun girl! Be sure to check out the other lovelies posting to WIR when you finish here! There was a lot of work going on around here this week. I’m pretty proud of what I accomplished. Lots of work in the basement in preparation for Recycling Day on Tuesday. Lots of recycling to set out. This was what went out at my house. My bin was almost too heavy for me to move by myself. I did manage it of course along with about a two foo high pile of cardboard that wouldn’t fit in. 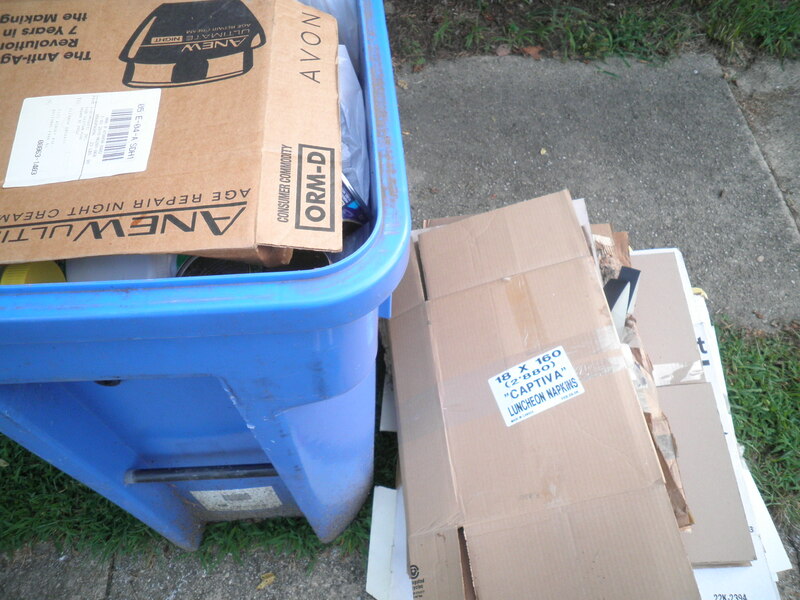 I also put out my friend’s bin, which she graciously allowed me to fill. Her’s was filled to the brim with useless boxes which necessitated my extra pile. After this I went to a dentist’s appointment for a cleaning. Found out I have to go back today to have something fixed. Not happy about that, but oh well. Wednesday was my annual OB/GYN appointment. Always a joy! I survived and when I got home, I headed right back to my happy little dungeon, er…basement to keep working. More basement time. You’d think I’d be finished by now, but no…there’s LOTS more to keep me busy down there! The long-awaited Trash day! I didn’t share my recycling or trash accomplishments last week and I wish I had. You’d be able to see exactly what I’m accomplishing here. 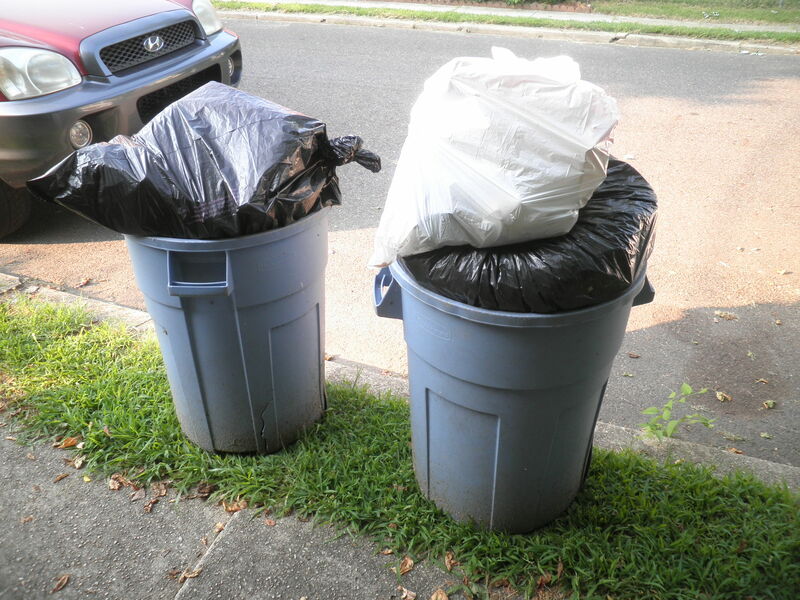 Trash…just for you! Yup, all mine. Doesn’t look like that much in this photo, but they were chock full and quite heavy. Late morning we headed down to Ralph’s house to check the mail and in my mind I was going to sort, toss and pack. 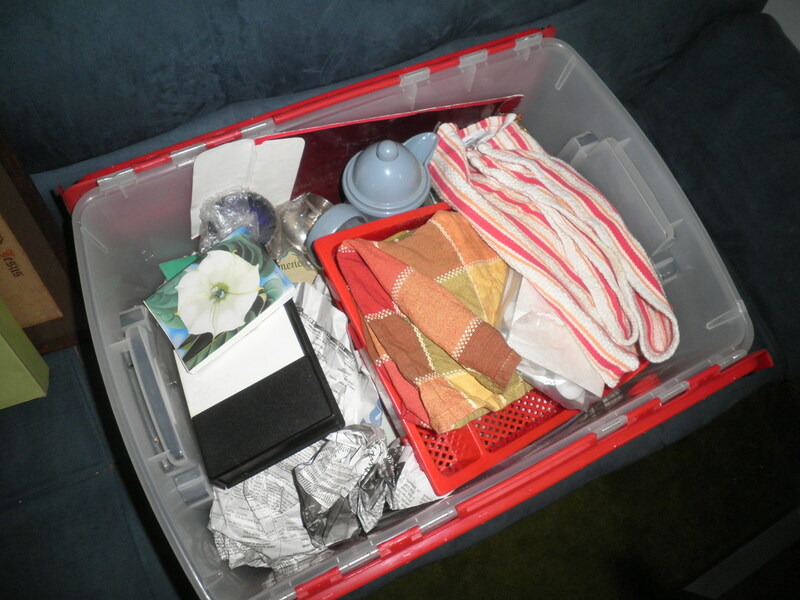 There are a lot of things stored there from when we had to clear out and sell my ex-husband’s house. It was a hard process and some things I couldn’t bring myself to part with at the time. I’m over that now and I got to work. There were about 8 bins/boxes I wanted to go through. I had an idea what was in them, but I hadn’t really looked since 2009, so I was a little hazy on some things. As has been my recent frame of mind, I headed into it being as unsentimental as possible. Some things were just trash…old toaster, old printer, old VCR tapes of TV shows. They went out to visit Mr. Trash Can. Some things needed a little more thought. 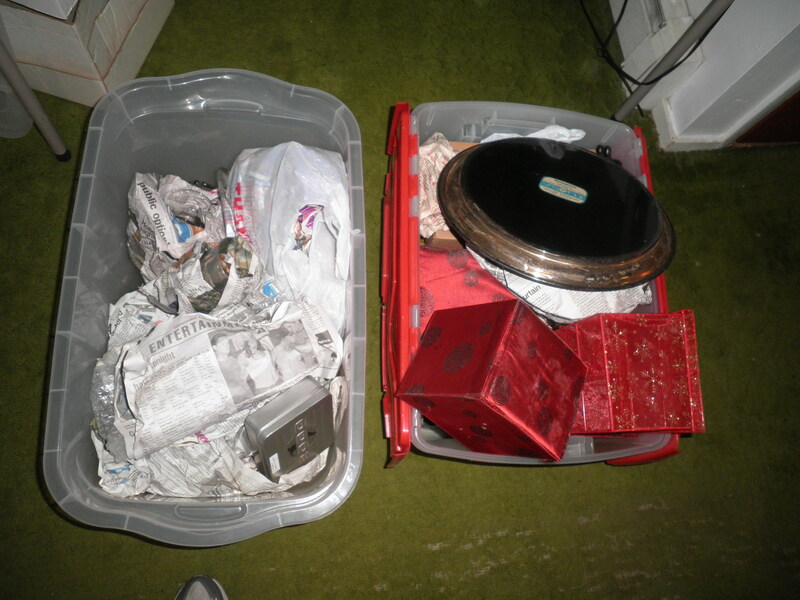 The box on the right along with another that I forgot to put in the photo are going straight to the thrift store. The one on the right has things that I think are a bit more valuable. Those I need to photograph individually. I know a lady in a nearby town who owns an antique shop. I think she might be interested in some of them, so I’ll see how that works out. That may not be accomplished until after my trip to Maine, but if I can work things out this week, it may happen before. Either way, they are no longer going to be my responsibility. One box…not even full is all that I’m keeping. What I’m keeping is mostly things that are actually useful. The process was tinged with sadness as this whole thing is, but I’m proud of myself. The antique furniture that’s there will be going with us. But there isn’t that much. There’s one thing there that I have a really hard time parting with. 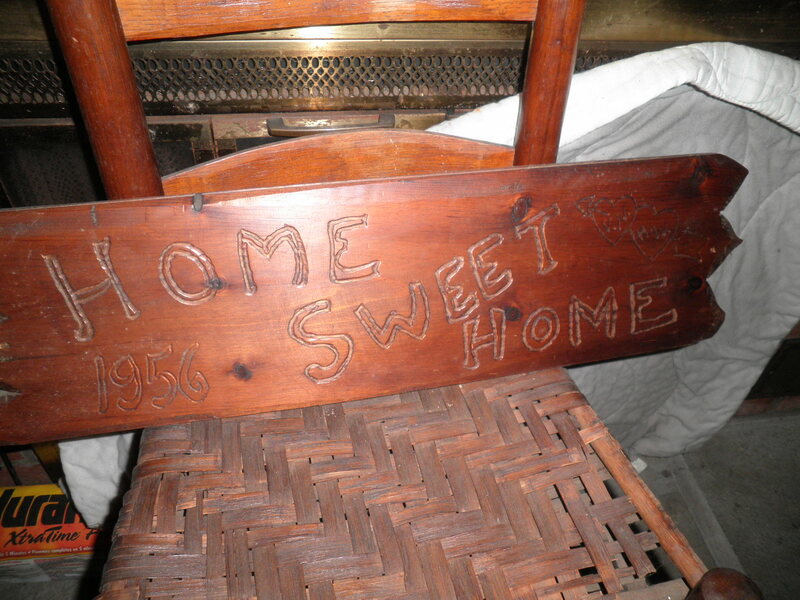 It came from the house where my ex-husband had lived with his parents in Lakewood, NJ. It was a wonderful old house. This hung over the door there. When He and his Dad moved out of that house, I insisted that it needed to come. I don’t really know why. It’s not that big a piece and for some reason I just can’t toss it. So for now, it is among my souvenirs and it will probably make the trip with us to NM. I think it would look appropriate hanging on the wall there. We’ll see what happens. I left the house drenched (there is no air conditioning there) but very happy for my efforts. As always, I was at Weight Watchers bright and early. Not sure what to expect with all of my hap hazard eating during the week and all of the humidity. I got a quarter pound loss for my efforts! I’m not really trying to lose but I guess this added activity is a plus. Here I sit on Sunday morning. My only specific plan for the day is to get together with my sister Ele when she’s finished with church. I’m been working so hard on all of this stuff that she and I have not had the chance to get together. We’re going for coffee…somewhere…not sure where just yet, but I’m looking forward to it. The coming week promises to be just as busy as this one. I’ll be gearing up for my trip to Maine. There will not only be sorting and packing but there will be actual packing for my trip. I’m trying an experiment where I take as little as possible, allowing me to take the smallest suitcase possible. We’ll see how that works! Don’t forget to check out the other WIR-ers over at Clean Eats, Fast Feets! I’m thinking you’re right about the extra activity, Sarah! I’ve been busy and I’m really happy for all that I’ve completed! Well! Haven’t you been the busy, busy, busy lady! As long as you don’t drive yourself crazy with this process, you’ll be OK.
You’ve got me laughing early this morning, Rob!! Very funny! Yes, I’ve been busy and I’m trying NOT to make myself crazy. I’m just happy to be seeing the change and the light that will finally get me to New Mexico. Have a great day! Holy cow Fran! I’m a bit behind here, but you have been a whirlwind of activity. Good for you! I can only image how proud you must be of accomplishing so much. I know your trip to NM is hinged on getting all this stuff done, and you are making fantastic progress. Give yourself a pat on the back!